Imagine a world without cheese. A world where God or natural selection had organised things in such a way that milk – the primal food of every mammal, including humans – inexorably went rotten (like fish or meat) when left for a time at room temperature, instead of coagulating as it does, under the effect of natural bacteria and turning into a basic form of cheese. If milk did not possess that magical property, generations of men and women would never have invented the hundreds of different kinds of cheese now in existence, and the world would definitely be a poorer place. So we have much to be grateful for. Of course, we might still have ended up with only a dozen or so different cheeses. Instead, we have anything from 700 to 2,000 varieties, depending on which authority and classification system one follows. The French alone have been responsible for inventing a large proportion of them, prompting the quip, variously attributed to Churchill and de Gaulle, that a nation that can boast 365 different cheeses must necessarily be ungovernable. Whether this is true or not, such ‘infinite variety’ – which Shakespeare saw in Cleopatra’s ageless beauty – certainly denotes a very strong streak of individuality. Today’s inventors of cheese are white-coated technicians in spotless laboratories who gear their talents to the findings of market researchers. The result, known as ‘giving consumers what they want’, is often insipid. In the past the process was very different. Cheddar, Camembert, Parmesan, Gruyère and hundreds of less familiar varieties of cheese were devised down the centuries by anonymous farmers and dairymen and women working in often not very hygienic conditions. They were well served by serendipity, imagination and trust in their own taste buds. After much trial and error, they succeeded in perfecting their particular cheese, and handed down its secret for future generations. 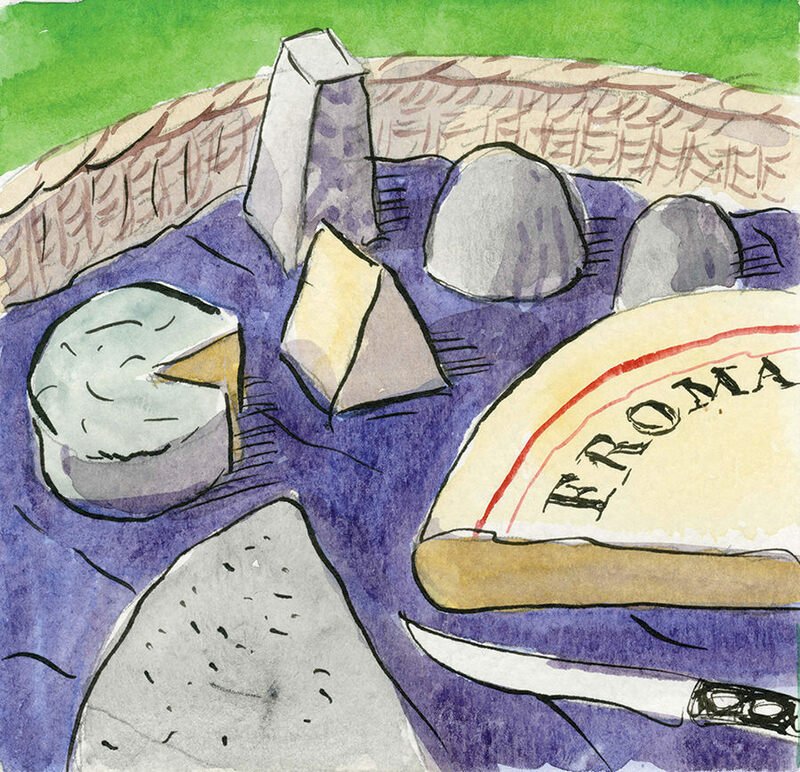 These real cheese-makers were true alchemists. Look, of example, at the dizzyingly large number of variables that go into the making of a cheese. They include: the type of pasture where the cows or goats are put to graze, the time of year they are milked, the breed of cow or goat that is milked, the type of coagulation induced, the way the fresh curd is cut and pressed, the technique of salting, the shaping of the cheese, the length of curing, the place of curing, the materials in contact with the ripening cheese (wood, straw, chestnut or vine leaves), and the extremely precise temperatures required at each stage of manufacture. The end product, not surprisingly, offers a multitude of guises, sizes, textures and flavours that is quite staggering given that the great majority of cheeses have but one ingredient: milk. Tiny Pélardon goat cheeses, for instance, make hardly more than a mouthful, while huge ‘wheels’of Parmesan or Comté weigh up to 40 kilogrammes each. The surface of Pont-l’Evêque or Handkäse has deep folds and wrinkles, while the rind of an unpasteurised Saint-Nectaire is dotted with a multitude of yellow, grey and rust-coloured yeasts and moulds. Mass-produced Edam has an aseptic coating of red wax. The crust of Stilton is as dry as sandstone, that of Boulette d’Avesnes as tacky as fresh paint. The same multiformity can also be found within. Some cheeses have holes in them – hundreds of tiny ones, like Samsø, or scores of yawning cavities, like Emmental, or else the occasional solitary eye, like Gruyère. The exposed edge of Parmesan, which needs to be split rather than cut, is as rugged as a cliff face. Slice into a really ripe Reblochon, and its cut surface will bulge for a time like a full goatskin and eventually spill out over the plate. The crumbly white mass of Roquefort is riddled with blue-green Penicillium roqueforti mould, while Wensleydale, as the playwright Keith Waterhouse delightfully put it in Mondays, Thursdays, ‘has the colour and texture of a milkmaid’s shoulder and when you bite into it you have a sensation of being tickled at the back of the throat by buttercups’. The astonishing polymorphism of cheese is paralleled by its versatility of aroma and flavour. Here the epithets become more difficult to find, because cheese has rather few organopleptic points of comparison. While a wine can be described as flinty or carrying a hint of blackcurrant or raspberry, cheese tastes more like, well, cheese than anything else. True, there are several ways of objectively describing or suggesting the smell and flavour of cheese – fresh, creamy , lactic, aromatic, nutty, sharp, pungent, strong-smelling and so on – but none of them circumscribes very precisely the actual experience of the taste buds and nose when one eats cheese. I have long been a cheese-lover, and in the course of living and travelling round France for the past 40 years or so, as well as regularly visiting other major cheese-producing countries such as Britain, Italy and Switzerland, I have had plenty of opportunities to indulge that predilection. So it was not as a complete novice that I began researching my book, Classic Cheese Cookery. I expected the domain of cheese cookery to prove fascinating but somewhat limited. Surely the canon could not extend much beyond such familiar dishes as Welsh rabbit, cheese soufflé, fish in Mornay sauce, pasta and cheese, fondue, raclette, gratins like cauliflower cheese, quiche and cheesecake? How wrong I was: at the end of my labours, and after much ruthless whittling down, I still found myself with some 330 compulsive – to me – recipes. What I had not been prepared for was the sheer variety of cheese cookery – a variety that results from a combination of three factors: different cheeses, different accompanying ingredients and different cooking techniques. There is much more involved in cheese cookery than merely using up a piece of old Cheddar (as some lazy cookbook writers recommend). A glance at the checklist called for by the recipes in my book gives some idea of the range of varieties that can be used. I, for one, had not been aware that cheeses like the powerful Maroilles or the mild Reblochon would take on a new and richer dimension when used in cooked dishes. Another surprise was the number of unexpected ingredients that can combine successfully with cheese, from salt cod, smoked fish, mussels and prawns to snails, tripe, brains and cepe mushrooms. I did not expect Gorgonzola with honey and cream, sweet/salt goat-cheese pie, toasted cheese with gherkins, onions and vinegar, or cheese, crab and apple gratin to be good – but they were. Lastly, it was interesting to see how cooking techniques breed further variety, particularly when cheese is combined with that other primal food, eggs. For example, three very basic ingredients – cheese, eggs and cream (or milk) – can together create a host of subtly differing flavours depending on the way they are cooked. Cheese in soup, not an altogether obvious combination, can produce some startlingly good results. The widespread use evolved by generations of peasant cooks of an inexpensive starchy envelope (pie, pancake, calzone, ravioli) enclosing a cheese-flavoured filling not only fulfils its original function (i.e. it ekes out the cheese), but also results in yet more textural and aromatic variations. At the risk of blowing my own trumpet, may I urge you to dip into my book on cheese cookery. You will find, I’m sure, that like cheese-making cooking with cheese is a highly enjoyable form of alchemy – and one that offers few disappointments and great rewards. Classic Cheese Cookery, Penguin, London (1988 and 1995). Winner of the 1988 André Simon Memorial Fund Award. Classic Cheese Cookery, Grub Street Cookery (reprinted without the original illustrations), London (2003).